Australian troops seemed to deal with the horrors of war with a kind of dark humour and a stoic attitude. Most men would have identified themselves as Christian but Australian soldiers were not known for their piety. Instead, a mix of fatalism and humour seemed to be the way men coped, even with events as extreme as seeing their friends lost in battle. It was not exclusive to Australian troops, but for many, the ideas of prestige and reputation, not the hope of survival was their primary motivation. Senior officers understood this and urged Australians to fight by arguing that how one would be remembered and the respect of their fellow soldiers was their most important legacy. In a trench situation, with churned mud in the summer and frozen earth in the winter, the status of food took on an increased importance. No man will follow you merely because of the official relationship. If you want the trust of your men, and their devotion and belief in you, you must treat them as human beings [...] The foundation of human life is food. The first duty of an officer is to look after his horse because it is dumb, then to look after his men and see that they are comfortably housed and fed, and, not until he has done this, to look after his own wants. Chapman-Huston, D 1916 Lecture by Major D. Chapman-Huston, Government Printer, Melbourne, Vic. 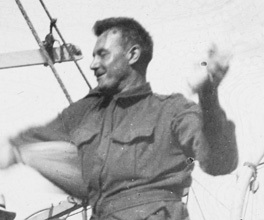 Australians were known for their lack of respect for any commanding officer that was too strict in assigning fatigue duties or those who did not participate in combat themselves. Those officers who were willing to 'lead from the front' inspired loyalty in their men, but they suffered a higher casualty rate. Four eggs each with fried potatoes, bread and butter and coffee. Yvonne opened her eyes wide at the order. The lot cleaned up we sent her off for four more each, with the necessary spud and coffee accessories. Then we sent for four more. Beyond words, Yvonne brought them in. With much gusto, I ordered another four, making a total of sixteen each. Mitchell, G D 1937, Backs to the wall, Angus & Robertson, Sydney, N.S.W. "Yvonne murmured ‘Mon Dieu’ faintly, as she went out to cook up the last order. I was all for sending for another plate, but Walter demurred, ‘She might think we are gluttons.’ But nature knows her business and wasted tissue has to be replaced. A few Malagas put me at peace with the world." Men were granted 10-day leave passes that they could use to go to England or Paris. Most Australian troops visited England. The British public generally welcomed Australian soldiers as their own people and civilians were eager to repay the debt now owed to those fighting. Australians became known for their extensive travelling, their lavish spending and their often rowdy behaviour. When Australia joined the war in August 1914, the reaction was one of excitement, especially among young men.